In the universe of online education, several methods of designing and delivering courses have been experimented with – self-paced learning, instructor-led online programs, blended learning, learning on mobile, networked learning and so on. Of course, many of these learning strategies or methods have been integrated into online course programs for better success among students/learners. Flipped learning, for example, is a type of blended learning where traditional classroom teaching is merged with online videos, instructional guides, and online lectures. While the study of concepts happens online, debating on these concepts, and activities are carried out in the classroom. All forms of instructional strategies would in some way or the other rely on these two mediums to enable learning. Let us dig deeper into the online classroom and learning technology in the next section to understand its importance in enabling learning. A Self-paced course is taken by the learners at their own pace. Typically, such courses have pre-recorded instructional videos, document-based content, quizzes without a scheduled duration. An Instructor-led course has to be taken by learners within a time duration. Specifically, an end-date to the course is given. If in case, the learner is unable to complete the course within the specified time-frame, the course will ‘expire.’ Why is it time-bound? Mostly, because this is the nature of instructor-led courses and at least some of the sessions are time-bound. For example, an online live class is on a particular date and time or an assessment, which needs to be completed by the end of the month to get grading and certification. Instructor-led courses mainly revolve around live instructor sessions with a mix of videos, assessments, and Some instructor-led courses can purely consist of a series of live sessions as well. To run such courses, software solutions or LMSs need to support technologies such as virtual classroom, course tools, assessment tools, among others. 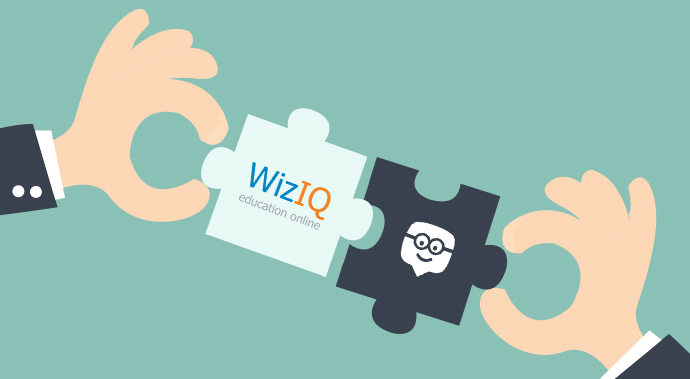 WizIQ e-learning platform is one of the few completely integrated SaaS platforms available in the global market which allows educators or trainers to launch self-paced, instructor-led, and pure webinar form of courses. Let us learn how to create a self-paced course and in the process also discuss the difference between instructor-led and self-paced course creation. Type of the course: Instructor can choose if the self-paced course will be a Free/Paid course. The currency specified here is the American Dollar. Add co-instructor: Instructor is allowed to choose a co-instructor from the list of instructors registered in the academy if required. Enforce Sequencing: The instructor can lock the course module using this option, which means that the learner will be able to proceed to the next section of the course only if he/she completes the preceding sections. Enable Discussions: Checking on this option will allow students to create discussion boards for a particular course. Course Schedule: This section helps the instructor to input course title and select activity. Course Schedule: Within the course schedule the instructor can create unlimited sections, for the course. For example, the first section may be, ‘Goal Setting’ second may be ‘Foundation of Teaching for Learning,’ and add many more such subsections. Activity: Under the course sections, the instructor may add activities. ‘Activity’ is defined as the smallest unit of a task which a student needs to complete before he moves on to the next activity. 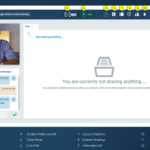 The instructor may add files, recorded classes, tests, for the students to work on or view. For example, the first one can be a recorded lecture, the second a worksheet, and the third may be a test for the students to complete. Uploading Files: Uploading files and videos is reasonably straightforward. Once the instructor clicks on the upload link, he/she can access files from Gmail, Dropbox, Google Drive, URL Link, bBox and Instructors can also pull a file from the WizIQ cloud-based library to upload on their course. Test: When the instructor clicks on ‘Test’ – he/she will have an option to either upload a test format or create a test from within the LMS. There are nine types of test formats within the LMS ranging from multiple choice questions to essay type. 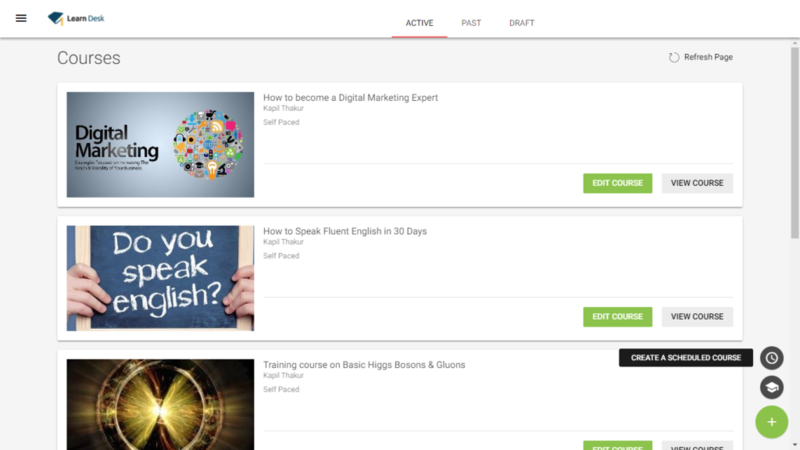 Course Profile: The last step to creating the self-paced course is the course profile section. 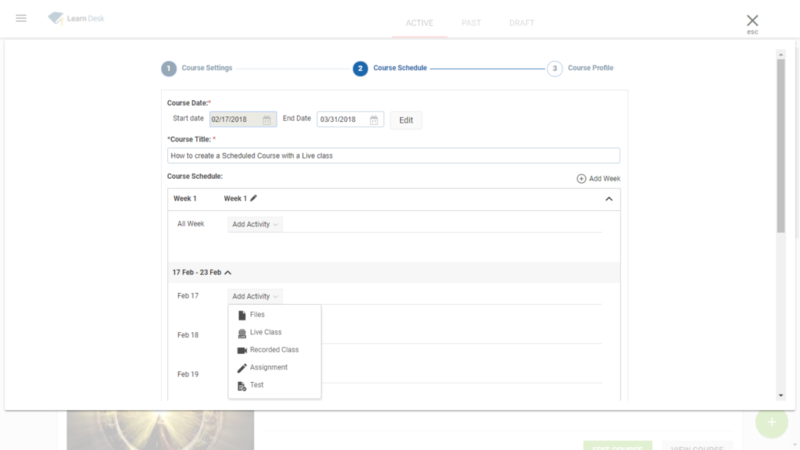 The course profile will show up as an overview snippet when the student logs on. The instructor must give a title to the course and add a short description for the students to get a sneak peek at what is to come in the course. Course Logo/pic: The instructor may upload brand logo or picture here. Language: At the bottom of the screen the instructor will be able to select his language preference in the drop-down. The English language is a default pick by the software. Save Draft or Publish Course: Instructor may choose to create drafts or publish the course. Publish Course: ‘Publishing’ the online course will make it visible to the instructor’s specified audience. Save Draft: If the instructor chooses to save draft, then the same will be available in the Draft tab in the Courses Menu option. The instructor may resume working on a draft at any time. 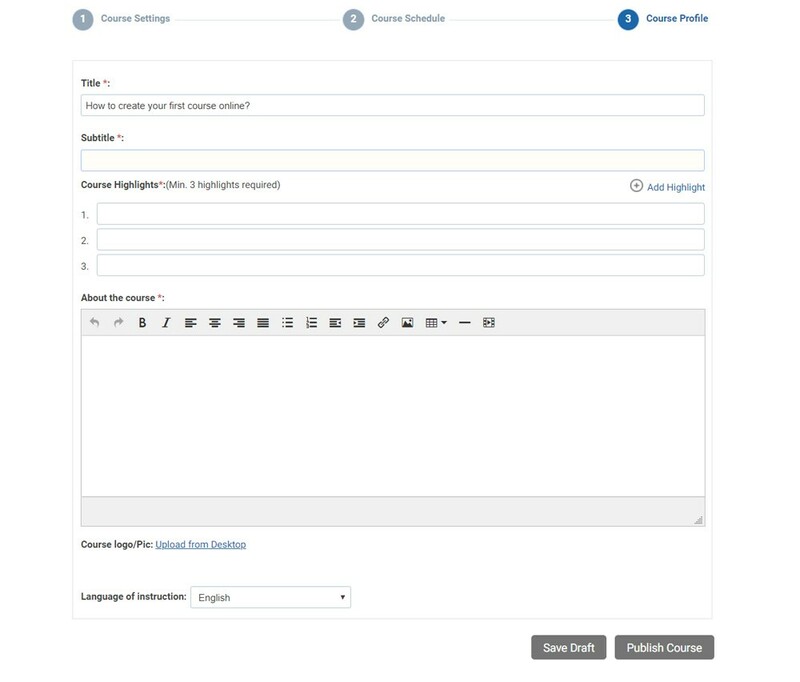 In the WizIQ Platform, when creating a course, the instructor encounters two options – the first one has been discussed under ‘Steps to create a self-paced course’ The other type is the instructor-led course, named on the WizIQ section as a Scheduled Course. The scheduled course has a particular start and an end date. The Course Settings Tab and The Course Profile Tab is the same as when creating the self-paced course. 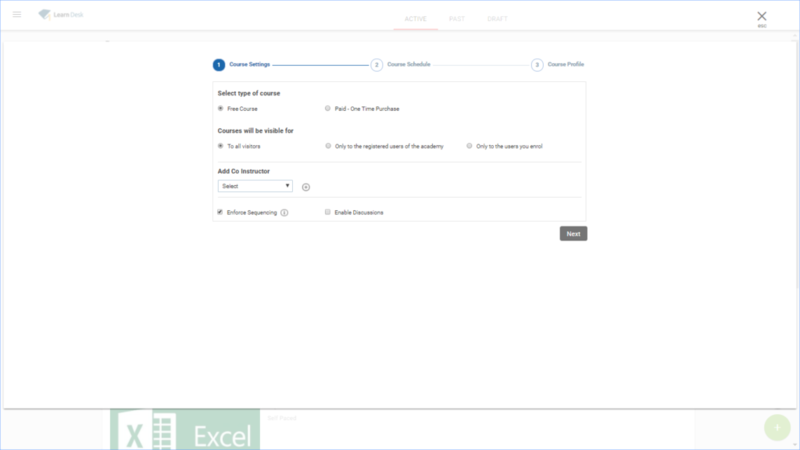 The extra step: Under the Course Schedule Tab ->Sections -> Activity -> the instructor will be able to add a live class as an activity that the student needs to complete before moving to the next section. The screenshot below will help the instructor to understand this subtle difference. Since instructor-led Courses may continue over days, the activity section has an additional option of creating a live class from within the instructor-led course. 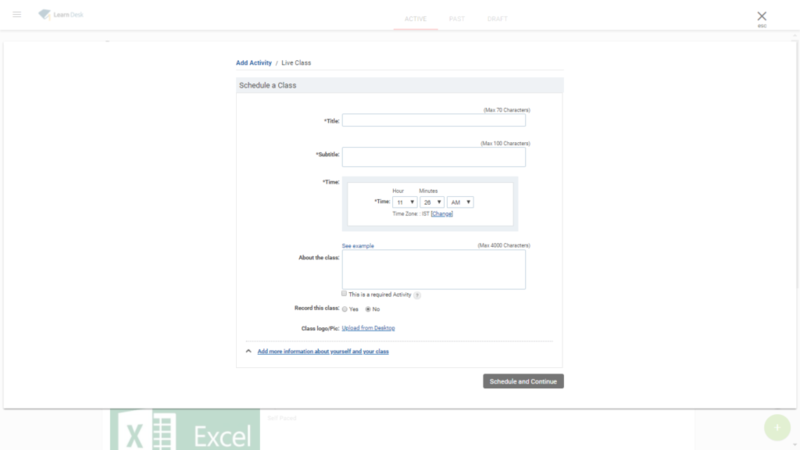 When the instructor clicks on ‘Live Class’ he/she will be led to the page with fields such as title, sub-title, add time and other details, explained below. The steps are exactly the same as scheduling a live class in WizIQ. Once the details are specified, and the instructor clicks on ‘Schedule and Continue,’ he/she is directed back to the Course Schedule page to continue adding additional activities for other days/week. Both these courses are supported by the Tests and Assessments and Reports and Analytics feature. The instructor will be able to monitor the progress of his class with detailed reports on class attendance, course completion rates, date enrolled on, enrollment status among others. The method of creating a self-paced course and an instructor-led course is straightforward. New methods of learning such as Blended and Flipped learning, can be implemented easily through the self-paced and scheduled (instructor-led) course. WizIQ is an end-to-end platform which takes care of launching of both these types of courses, hassle-free. 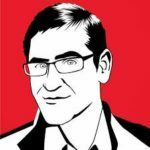 Vivek Singh is a digital marketer at WizIQ, the world’s largest cloud based e-Learning platform.